Krone’s all new ECTC 400 and 500 mowers are packed with industry leading technology, available in steel roller conditioner, rubber roller conditioner, flail conditioner and non conditioner models. The optional 3m transport kit allows operators to now change from transport mode to working mode in less than 30 seconds all without leaving the tractor cab. The new ECTC 400 and 500 mowers are designed to handle the toughest of Australian conditions. 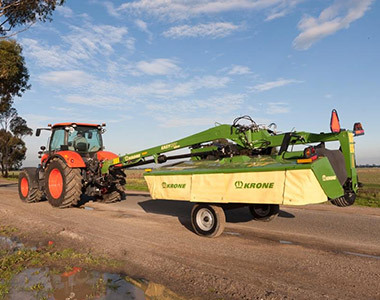 Built tough to handle any conditions in the field, Krone fully welded one piece construction cutterbar provides the resilliance that contractors and farmers alike look for. 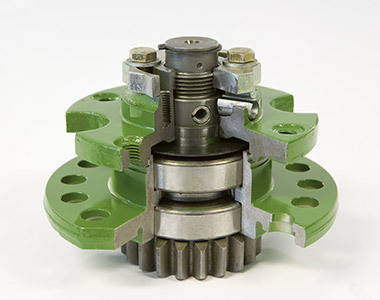 The satellite gear system comprises of large idler gears that turn slowly to reduce noise and heat. The larger idler gears provide increased tooth contact surface area with adjoining gears , reducing the stress on each gears. 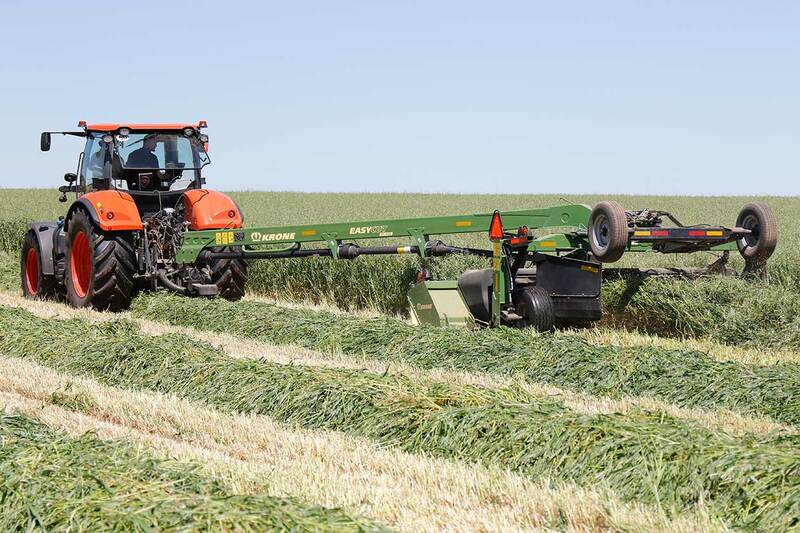 Krone mowers feature large over lap between discs, this results in the perfect stripeless cuts. Modify crop stream by swapping cutting disc rotation direction to optimise crop flow and windrow formation. All Krone mowers are built to stand the test of time, with only the highest quality components used you can be sure that your Krone mower is built to last. Heavy-Duty tapered roller bearings allow for higher load carrying capability and can withstand higher shock loads. 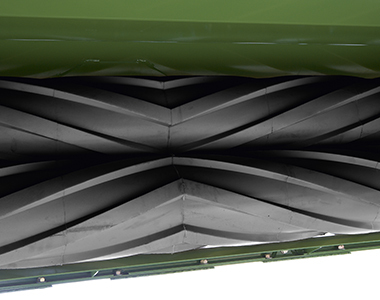 Steel roller conditioners: The crimp style is especially effective for stiff or heavy stem material and produces well-formed windrows over a wide range of widths. Steel rollers are extremely durable and require minimal maintenance. 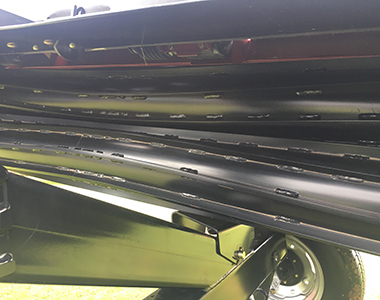 Polyurethane roller conditioners: The rollers deliver a combination crimp-and-crush action while being gentler to leaves. Flail conditioner: The v-tine conditioner removes the stem wax with a crimping action to promote dry-down time. Non conditioner machines are also available when conditioning is not needed. Optional 3m transport Kit, save time and money when transporting your mover down the road, no longer need permits or vehicle escorts when moving the mower from paddock to paddock. Go from working position to transport position in just 30 seconds all while staying seated in the cab. Optional quick change blades makes changing blades in the field a breeze.